Not only does this cat have two faces — because his faces can sneeze, eat, and sleep separately, his veterinarians think Lil’Bit has two independently functioning brains. At seven months old, he seems to be faring pretty well, considering his condition. He does have some trouble with the litter box, but his (very obliging) owner has solved that problem with diapers designed for premature babies. What do prehistoric insects and the internet have in common? Imagine what it would be like if this cute little dragonfly, cruising around your backyard, had a two-foot wingspan. It’s not sci-fi — it’s ancient history. Such giant dragonflies were a common sight in the swamps and coal forests of the Paleozoic era. Five-foot long millipedes, too. To find out what the series of tubes has to do with the size of an insect, <shameless plug> check out my article about it in Discover </shameless plug>. Hint: it has to do with atmospheric oxygen concentration. And if this makes you wish with all your heart that you could time travel back to the Paleozoic to see those 2-foot-wingspan dragonflies, you might try to get your hands on the WowWee DragonFly. It has a paltry 1-foot wingspan — but you get to control its flight. I’m too lazy to write a useful new post because I just spent 3 hours going through a messy divorce with iWeb and moving all my furniture and possessions to the house of my rebound boyfriend, WordPress. So here, instead, is a half-wet elephant. Or maybe it’s two-thirds wet. Wait, are we talking volume or surface area? What’s the surface area of an elephant, anyway? Where S is surface area in square meters, H is shoulder height in meters, and FFC is forefoot circumference in meters. The BBC tells us that Indian elephants have a shoulder height of 2.5 to 3 meters — let’s go with 2.75. And a PBS classroom resource tells us that forefoot circumference is equal to about half of an elephant’s height, so we’ll call it 1.375. That works out to about 20 square meters, or 215 square feet. So I guess that’s my answer. An average Indian elephant has a surface area (albeit crudely estimated) of 215 square feet. ANOTHER EDIT: My tape measure says that’s twice the size of my bedroom. 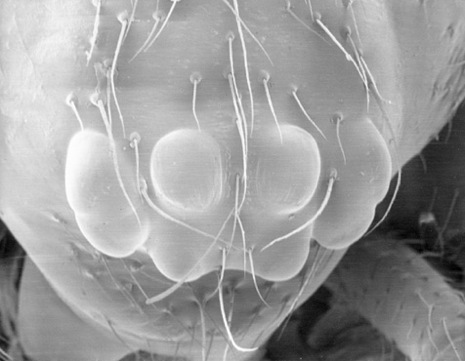 I took this scanning electron micrograph of a spider head back at Smith. It’s a little bleached-out-looking (I hadn’t really mastered the instrument) but nonetheless gorgeous and creepy.